The core audience of Digital Health Rewired are those driving change within health and care every day. Building on the leadership networks we host and the coverage and insight we provide, Digital Health’s events attract local IT leaders from across the NHS and wider UK healthcare, together with innovators from across the burgeoning digital health sector. Digital Health Rewired will open on Day 1 with the Rewired Leadership Summit, the fourth edition of the successful annual conference attended by senior health IT leaders from Digital Health Networks. 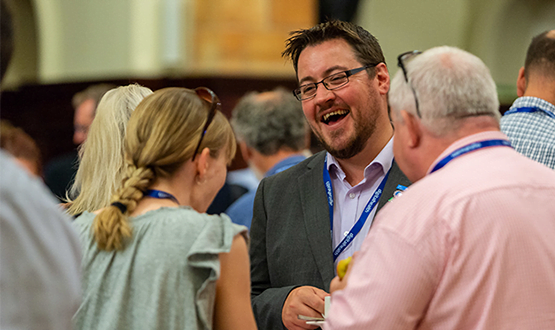 Day 1 ends with an evening networking event for all speakers, delegates, exhibitors and sponsors who have either attended the Summit, or will be attending the Rewired Expo on day two. Open to all in health and care, the Rewired Conference and Exhibition (Expo) on Day 2 at Olympia London showcases the latest digital innovations in UK health. Rewired provides a fantastic opportunity for you to profile your business alongside the work of your clients in the sector, as a sponsor or exhibitor. Who will attend Digital Health Rewired 2019? 600+ core delegates including NHS CIOs and IT directors, CCIOs and clinical IT leaders, CNIOs, chief executives, finance directors, and other senior health executives. A further 600+ delegates from a range of management and operational level roles within health IT. 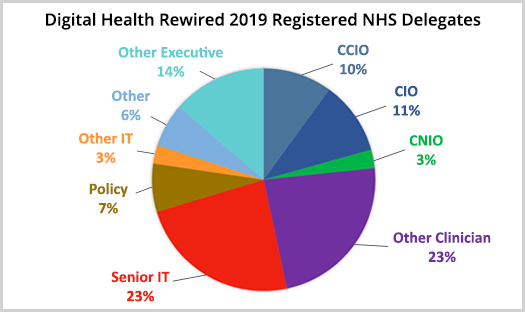 The diagram below indicates the professional roles of NHS delegates who have registered for Digital Health Rewired 2019 so far. To get the senior decision makers in one place for open discussions with peers and first-hand understanding of their security reservations has been invaluable. The Rewired Expo is divided into six connected feature zones, each exploring key topic of expertise with exhibiting stands and a dedicated conference track. These are AI and Analytics, Clinical Software, Cloud and Mobile, Cyber Security, Digital Imaging and Integrated Care, enabling you to make a deeper connection with your relevant audiences. As a one-day exhibition with ready-to-use shell scheme stands, exhibiting at the Rewired Expo is pain-free. It also means you spend less time and money organising your stand and more time growing your clientele. Sponsorships are available for the feature Zones of the Rewired Expo on Day 2, all include a speaker slot. Speak to our sales team about further sponsorship opportunities available at Rewired. For more information and to secure your place, contact us using the form below.